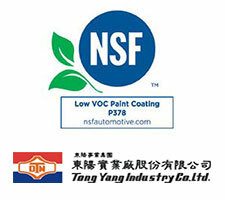 ANN ARBOR, Mich. – NSF International, a global organization with more than 70 years of certification experience, announces that Tong Yang is the first manufacturer in Taiwan authorized to use the NSF Sustainability mark on bumper covers that use low VOC paints and primers in addition to recycled content in their packaging materials. In 2012, Tong Yang’s bumper components were among the first parts to be certified by NSF International’s Automotive Parts Certification Program, which certifies high quality parts that are equivalent in form, fit and function to the OE service parts and meet NSF’s other rigorous certification requirements. To earn the recent additional Sustainability certification, NSF International audited Tong Yang’s manufacturing facility to determine compliance with the U.S. EPA’s National Volatile Organic Compound Emission Standards for Automobile Refinish Coatings and the VOC content limits set by the state of California. NSF International certified automotive parts manufacturers undergo in-plant audits and their parts must pass vehicle test fit (VTF) and appearance, surface coating, material thickness, material composition and performance/function evaluations as well as meet in-plant quality control testing and packaging requirements. Only manufacturers that meet these requirements, and who also pass NSF environmental audits, are authorized to use the NSF International Sustainability mark. NSF International was the first organization to introduce a mark during NACE-CARS 2015 to identify automotive parts that use low VOC primers and paints as well as recycled packaging and other environmentally-friendly material and processes. Automotive parts that have earned NSF International certification are listed on the certified product listings page. Parts that meet additional sustainability requirements are noted in the listings. Automotive Collision Parts Distributor Certification, which certifies distributors who sell aftermarket parts. Collision Repair Shop Certification, which certifies the capability of a repair shop’s facility, procedures, training and internal processes to execute higher quality, consistent and safer repairs. Automotive Recycler Certification, which confirms recyclers’ ability to meet extensive grading, labeling and traceability requirements as well as federal, state and local recycler regulations. Manufacturers or distributors of automotive parts, repair shops and auto recyclers seeking more information about certification can visit nsfautomotive.com or contact the NSF Automotive Certification Team at autocert@nsf.org. About NSF International: Founded in 1944, NSF International is an independent global organization that writes standards, and tests and certifies products for the food, water, health sciences and consumer goods industries to minimize adverse health effects and protect the environment (nsf.org). In addition to NSF’s Automotive Aftermarket Parts Certification Program, the company is one of the world’s largest automotive registrars to ITO/TS 16949 via NSF International Strategic Registrations (NSF-ISR). About Tong Yang: With over 30 years of marketing experience and more than 10,000 sets of tooling in possession, Tong Yang serves over 1,800 customers in more than 200 countries worldwide. In order to provide just-in-time inventory replenishment services for aftermarket customers, Tong Yang built manufacturing plants in Italy and China. By integrating all products in Taiwan, Tong Yang offers more than 10,000 varieties of products to fulfill customers’ needs of parts and services in one stop.